Facebook has recently had a valuation of $50 Billion USD after Goldman Sachs invested in the company. 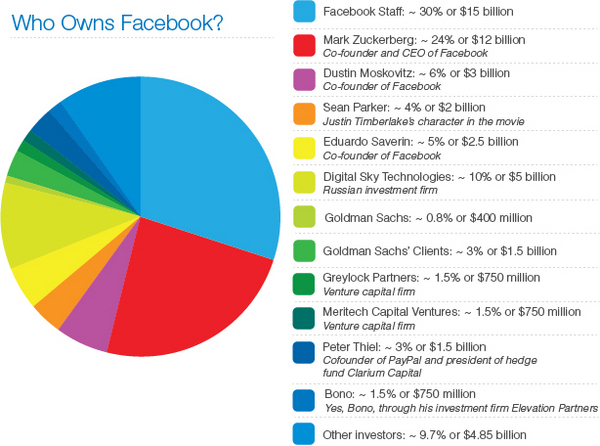 So who actually owns Facebook? Interestingly enough Mark Zuckerberg, his Facebook staff, and Co-Founders still own over 60% of the company. Not specifically included in the infographic are Microsoft’s 1.6% stake, Hong Kong billionaire Li-Ka Shing’s 0.8%, TriplePoint Capital (though as a debt provider they own nothing), and Accel Partners’ investment.